With warmer weather and the disappearance of the East wind Spring has finally arrived. On the 30th April I visited Marshside, Southport for the first time in years. I have to say it was a little disappointing with most of the Black Tailed Godwits having moved on and very few of the Avocets came within camera range. I did, however, manage to obtain a sequence of shots of a pair copulating. Whilst at Marshside I saw my first Sedge Warbler, Reed Warbler and Swifts of the year. 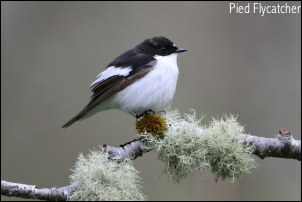 During the week I filmed a pair of Pied Flycatchers as they chose a nest – box for the coming breeding season. The male had a ring on its leg and as none have been ringed in the wood where I was filming we shall never know where it was originally ringed. In the garden the Siskins have now moved on. The Redpolls however continue to increase and on the 4th we had a record eight feeding together. It is impossible to know how many Reed Buntings are coming to feed but there could well be more than a dozen individuals.